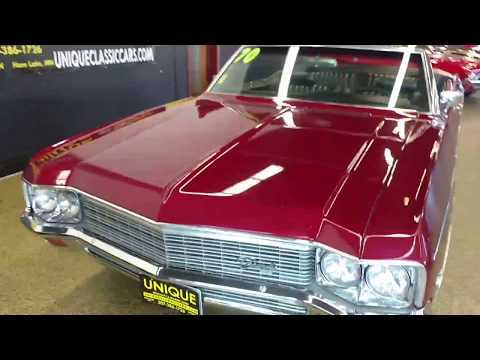 1970 Chevrolet Impala Convertible, VERY clean! TRADES/OFFERS? Here is a very nice example of a 1970 Impala convertible with the Turbo-Fire 400 265 HP engine paired with an automatic transmission. This car has been owned by the same family for the last 22 years and they decided it was time to let it go since they just weren't' driving it enough. It has had a repaint quite some time ago but the paint still has a nice luster, shines up well, and looks good on. (there are a few chips and imperfections, see pics) The convertible top is in good shape and will keep you protected if one was ever caught in the rain while driving. It is a factory A/C car with power steering and brakes as well as a power top. The previous owner believes it to be actual miles and by looking at the condition of the original interior as well as the underside of the car it's quite possible. The floor pans do not look like they have been replaced and there is still undercoating that looks original to the car nothing that has been recently put on to "cover" something up! There's nothing to hide on this car, if you're looking for a car you can get in and go down the road in this is a great candidate. Feel free to call us with any questions you may have. We welcome inspectors if you would like a 3rd party's opinion and will represent this car as fairly as possible. Call Jay, Jeff, or Landon at 507-386-1726 or email "sales@uniquemankato.com" ALL TRADES AND OFFERS WILL BE CONSIDERED AND FINANCING IS AVAILABLE!